During a two part interview on the Thursday and Friday CBS "Early Show," co-host Maggie Rodriguez asked Hugo Chavez’s ex-wife, Marisabel Rodriguez, "Is Hugo Chavez a charismatic leader or a mad man?" This was followed later by the question, "Is he a Communist?" To which Marisabel Rodriguez responded: "If he's not, he's very similar to one." Just last week Hugo Chavez reportedly boasted about chewing coca leaves, which is the base of cocaine. What do you think about this? Could this have altered his mind?...Do you think he should step down as president of Venezuela? MAGGIE RODRIGUEZ: Do you believe in the end that democracy will triumph in Venezuela? MARISABEL RODRIGUEZ (TRANSLATOR): I believe and wish it will like all Venezuelans. Sometimes you don't appreciate what you have until you lose it. Once you lose freedom in a democracy, it would be hard to gain it back. MAGGIE RODRIGUEZ: It's not lost yet? MAGGIE RODRIGUEZ: The controversial president of Venezuela, Hugo Chavez, is lashing out at the U.S. again. At the United Nations in 2006, Chavez compared President Bush to Satan. Now he claims the Bush Administration is engaging in an economic war because the U.S. has sided with Exxon Mobil in an ongoing dispute with Venezuela. I had the rare opportunity to speak exclusively with his ex-wife, Marisabel Rodriguez, from her home town of Barquisimeto, Venezuela. I asked this now outspoken critic of Chavez what she thinks of his move to stop selling oil to Exxon and potentially to the U.S., the largest buyer of Venezuelan oil. MARISABEL RODRIGUEZ (TRANSLATOR): I guess it's nothing out of the pretext to do something that he's been threatening for a long time. This is a personal dispute. Make no mistake, the United States of America, the people of the United States and the people of Venezuela are brothers like all American countries. The problems with who's currently governing and the people should not suffer the consequences of animosity between two presidents. This will hurt innocent people, just like you're hurting us because when our economy suffers a collapse because we don't have our main buyer, that is going to deeply affect our economy. MAGGIE RODRIGUEZ: Just last week Hugo Chavez reportedly boasted about chewing cocoa leaves, which is the base of cocaine. What do you think about this? Could this have altered his mind? MARISABEL RODRIGUEZ (TRANSLATOR): It's surprising to me that he talks about this so casually. Listening to him, how he talks about this so naturally without wanting to go too far, I believe he's not taking this seriously as a head of state. Because I believe that the young people deserve from people in power some responsibility towards the destiny of the country, the young, the boys and girls, they're like sponges. All we do now is shaping the personality of this youth and childhood. Therefore I believe it's very serious to have this type of public behavior. MAGGIE RODRIGUEZ: Do you think he should step down as president of Venezuela? MARISABEL RODRIGUEZ (TRANSLATOR): I should not answer that question. All Venezuelans should answer it at some point during the electoral process. That question must be in the minds of many Venezuelans. MAGGIE RODRIGUEZ: He has befriended Fidel Castro of Cuba, Ahmadinejad of Iran. I'd like to ask you something that is widely debated in this country. Is Hugo Chavez a charismatic leader or a mad man? MARISABEL RODRIGUEZ (TRANSLATOR): Actually, I need to respect others in order to be respected. I would be disrespecting him were I to answer this kind of question about him. First of all, I lived with him. We have a beautiful daughter in common whom I would like to keep the best memories of this relationship since she was conceived in a different environment than the current one. MARISABEL RODRIGUEZ: (TRANSLATOR): If it were lost, I wouldn't be doing this right now. MAGGIE RODRIGUEZ: Are you afraid for your life? MARISABEL RODRIGUEZ (TRANSLATOR): No, no. Mainly because I trust God, there are risks everywhere, the truth, or rather reason, must prevail. I feel like the creator of that constitution. I must defend it. MAGGIE RODRIGUEZ: She insisted on speaking Spanish so that she could be clear, so that's why I asked her the questions both in English and Spanish. 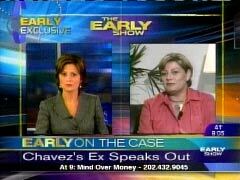 Tomorrow in part two of my interview, the former Mrs. Chavez reveals intimate details about her Ex that no one else could know and she talks about her own possible run for president. MAGGIE RODRIGUEZ: Venezuelan President Hugo Chavez is a larger-than-life figure, an outspoken critic of the U.S., on the world stage with Fidel Castro, Mahmoud Ahmadinejad, even Sean Penn and Naomi Campbell, celebrities who've had their pictures taken with him. But Hugo Chavez maybe in trouble at home, especially if you listen to his ex-wife, who helped him draft the constitution in 1999. In my exclusive interview, I discovered Marisabel Rodriguez may have designs on that job herself. MARISABEL RODRIGUEZ (TRANSLATOR): He's a great human being with a big heart, but at some point I believe he has taken a wrong direction for the project for which we all fell in love at first. Who doesn't want a better world for people, for the underprivileged, but to support a communist or a radical socialist project, I cannot do that. MAGGIE RODRIGUEZ: Is he a communist? MARISABEL RODRIGUEZ (TRANSLATOR): If he's not, he's very similar to one. MAGGIE RODRIGUEZ: Did you divorce him for political or personal reasons? MARISABEL RODRIGUEZ (TRANSLATOR): They go hand in hand. When you're living with a person with such an important political responsibility, you need to help him, support him, and support him quite a bit. But the political reasons impacted the personal ones because our views were very different. You start bringing home all the problems from work. When there is such a gap in like views, different vision of the country, vision of the world, it becomes impossible to live together. MAGGIE RODRIGUEZ: As someone who was married to Hugo Chavez for eight years, who helped write the constitution in1999, someone who knows him intimately, what position is he vying for on the world stage? MARISABEL RODRIGUEZ (TRANSLATOR): I guess it's evident that it's an aspiration for power, to strengthen power that he already has. But I believe it's dangerous to amass so much power. So much power shouldn't be given to one person. Our liberator Simon Bolivar said that himself. MAGGIE RODRIGUEZ: You sound like a politician. Do you have political aspirations? Might we one day see you as president of Venezuela? MARISABEL RODRIGUEZ (TRANSLATOR): I don't know. MAGGIE RODRIGUEZ: Would you like it? MARISABEL RODRIGUEZ: It's not part of my plans right now. Well yes, I would like it because I love my country very much. It would be a great honor to lead the destiny of your nation. MAGGIE RODRIGUEZ: And you can see the entire interview in Spanish on our website, cbsnews.com. By the way, Chile and Argentina both have female presidents, but Marisabel Rodriguez would be the first to run against the policies of her ex-husband.